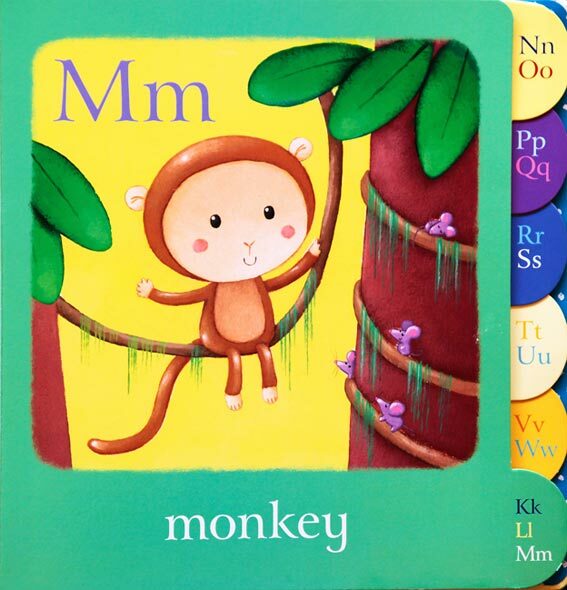 ABC learning for tiny tots. What I immediately liked about this book was the novelty of index tabs down the side of the pages. We can quickly turn to Gg and Hh which share a tab. 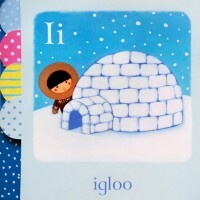 It gives the book a sort of reference feeling that might be useful in an early learning environment. More directly it makes the pages easy to turn, something that can be a little frustrating for toddlers. 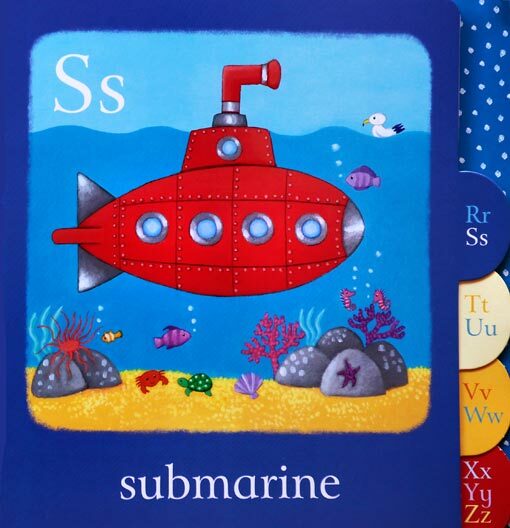 Each large page is made of a heavy card, lighter than the small chunky pages of the standard board book. 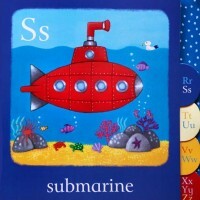 The larger format may also makes the Usbourne Alphabet Picture Book a good size to be shared with a friend or sibling. 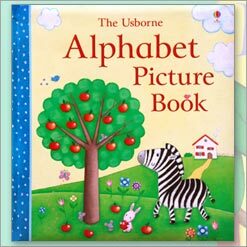 Sadly A is still for Apple instead of Antelope or Ambulance, but this can be forgiven as most little ones know what an apple is long before more exciting things like Afghans and Angelfish. 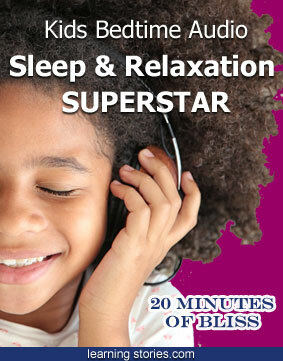 The pictures are stylised and friendly with lots of pretty images. 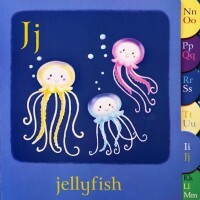 Sweet faced smiling jellyfish bob innocuously for Jj. The bold bolted body of a red submarine waits enticingly above coloured corals and crabs at Ss. The colours are heavily saturated and will not be to everyone’s taste, but in most pictures this works well with the simplified shapes and slightly saccharine styling. The last double page spread has a thumbnail of every page so the letters can be looked at together. 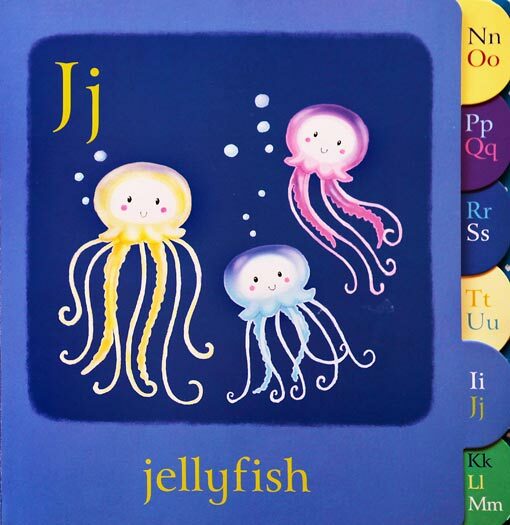 Another appealing version of the alphabet picture book. Publication Date: Brdbk ed. June 2011.